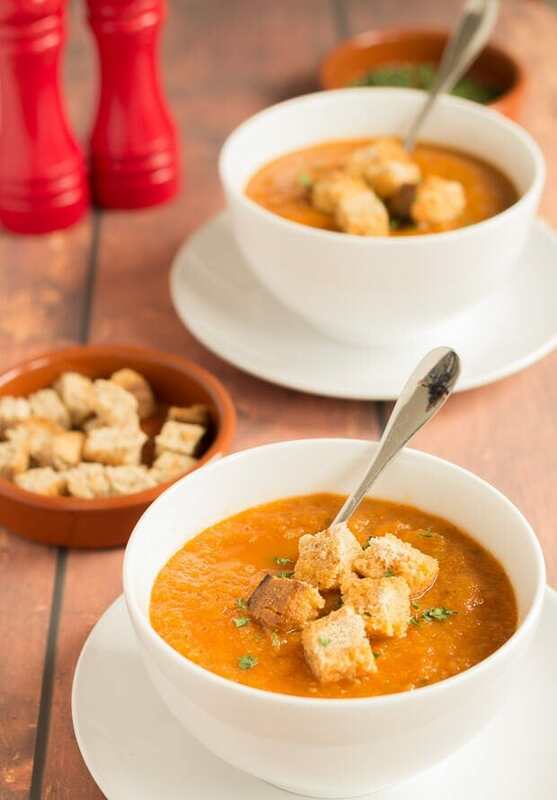 This Mediterranean vegetable soup is just 100 calories per serving and at the same time it’s full of flavour and extremely filling. 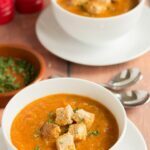 If you’re feeling that you’ve over indulged a little recently, then this soup is a great aid to weight loss and will help you get right back in shape again! You know folks, good food like this Mediterranean vegetable soup has the power to change your whole outlook. Half an hour ago I was looking out of the window here in Glasgow. At a grey and rainy day. It’s Easter weekend. It doesn’t look like there will be any spring sunshine appearing here today. Have a bowl of this delicious energising “hug in a bowl” soup. Now, as I sit here typing up this delicious vegetable soup recipe. I’m struck by just how much more energized and enthusiastic I suddenly feel. It’s true that good healthy food changes your perception and how you feel about things and yourself. I put it down to the colourful array of Mediterranean vegetables and flavours mingled into one in this soup. And that enormous burst of vitamins and minerals that it brings. It’s a ray of Mediterranean sunshine, especially when there isn’t any outside! Anyway, I’m sure you’ll agree when you try this yourself. And we can always hope for some signs of spring here this coming weekend can’t we? Tell me. What kind of foods change your mood outlook suddenly? 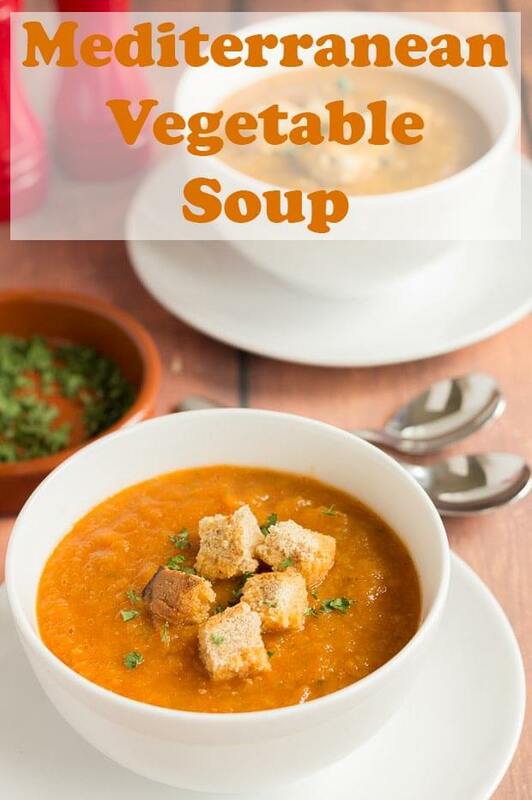 Not only is it a healthy soup recipe but it’s also low cost, filling and nutritious! It makes about 8 portions. There’s plenty to go into the freezer for meal prep for the week(s) ahead. It’s an easy soup to make. There is no need for any sautéing. Everything just gets chopped up and then cooked in the same pot. It is so tasty! 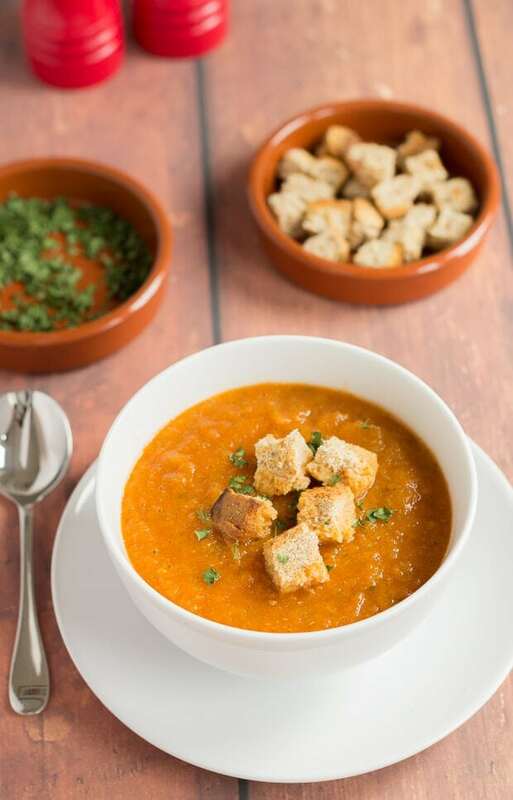 Based on a traditional Mediterranean soup recipe you get that tomato taste of a classic Mediterranean vegetable soup. What’s not to love about a 100 calorie soup? It’s the soup I ate the most of when I was getting myself properly in shape back. It helped me lose 2 stones in weight. That’s why I know this soup will help you too. If you’re just beginning your weight loss journey and embracing a new 80/20 healthy lifestyle. You will need your largest soup / casserole pot for this Mediterranean vegetable soup. I like to puree all of the soup, once the vegetables are cooked, but if you prefer a “chunkier” soup then just puree half of the vegetables instead. And if you’re looking for other recipes to bring a bit of sunshine back to your life and also aid weight loss then why not try my delicious and popular Mediterranean vegetable casserole recipe? Why not try adding different vegetables yourself? This soup can be easily frozen too. 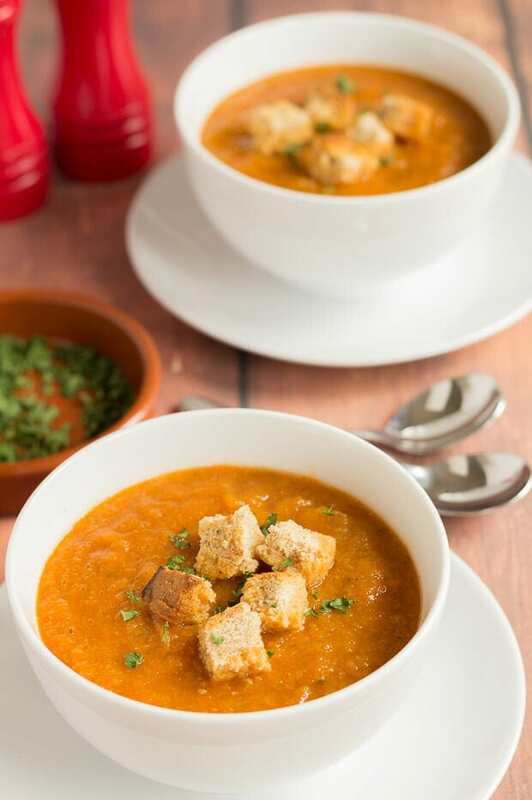 This Mediterranean vegetable soup is just 100 calories per serving and at the same time it's full of flavour and extremely filling. Place all the ingredients into a large soup pan and cover. Bring the soup to the boil and then turn down to simmer for about 20 minutes, or until all the vegetables are tender. Serve topped with the wholemeal croutons. It might sound silly, but a vibrant healthy salad gets me in a good mood . Also, ceviche and raw seafood (or cooked, but I love sashimi). There is just something so refreshing about it! Nothing silly about that at all Suz! This looks really good and I appreciate you sharing. It’s supposed to be pretty chilly the next week so I might make some! I had hoped that it was getting warmer here Hollie, as we had turned the heating off, but alas it’s back on again tonight! This looks so comforting! I can’t believe it’s only 100 calories. I know Megan, I actually had to key in the ingredients twice into the nutrition label I use to believe it myself! Creamy, leeks, and zucchini? Sounds good to me! You are spot on Neil – good, healthy food sure can change one’s perception and attitude for the better – just the opposite of what unhealthy food does – right? By the way – those pureed veggies make this soup look so creamy – and delightful! Happy Thursday! Yes – spot on Shashi, I agree totally with you. It’s what you put in that depends on what you get out, don’t you think? This sounds and looks great! I’ll have to add it to my list of things to make. Thanks for sharing! Thanks so much Shannon! Hope you enjoy! That sounds like an amazing combination GiGi. I think chunks of chicken or turkey would add a delicious “chunky” combination to this. I love how low in calories this soup is, and anything that makes use of tinned tomatoes is good with me! We are still very much in soup eating mode, until the weather heats up anyway. It’s amazing just how a simple tin of tomatoes or two can make such a delicious vegetable soup combo isn’t it Dannii? And one that is so low in calories too! I agree, your weather is probably much like ours seeing as we’re only just up the road from you in Glasgow. It’s still pretty chilli isn’t it?